You can read more about the Day of the Dead as a Catholic celebration here. I love these painted sugar skull rocks from Color Me Happy! I think kids would have a really fun time creating these! Find directions on how to make actual Sugar Skulls with Tablespoon.com. Sugar skulls are super traditional for this day. You can get skull molds at the Dollar Tree. Just sayin’. 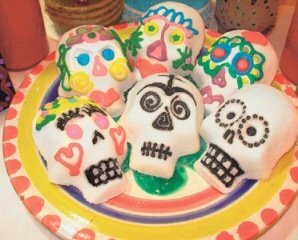 These Sugar Skull Marshmallow Pops from Mom.me are genious becasue no mold is necessary, and even small kids could help with these cuties! And also from Growing Up Bilingual is this adorable sugar skull fruit pizza. Love it! It’s true that the Day of the Dead does have some traditions that are rooted from the Aztec natives from Mexico. Catholics, however, choose to see the Day of the Dead as a day to pray for the souls in purgatory, which is a deeply Catholic belief and tradition. In fact, Protestant Christians do not believe in praying for the dead, as they don’t believe in purgatory. It is a practice which Catholics get from 2 Macabees in the Bible, a book which Protestants are missing from their Bibles. Man I knew I should have grabbed those ice trays at Dollar Tree for something! Maybe they'll be on clearance next time I get there… 🙂 Great ideas!